The Gemco 925 Series Cable Reel can be used as a linear position sensor in any industrial application to monitor a linear or reciprocating machine motion. The sensor package, along with the associated electronics (i.e. programmable logic controller, programmable limit switch, counter card, etc.) can sense the position of any linear motion and can, therefore, be used to control machines. The system consists of a heavy duty spring motor assembly attached to a precision machined cable drum. As the cable is pulled off of the precision drum, the drum rotates a shaft connected to it. This shaft is precisely geared such that the full number of revolutions of the drum is equal to the appropriate number of revolutions required by the chosen sensor. This approach to machine positioning has several advantages over traditional limit switches. 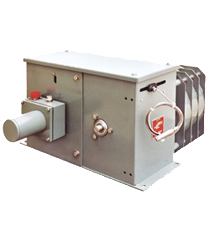 In hostile environments, such as many steel mill applications, the cable reel sensor can be mounted remotely. This protects the sensor from excessive heat, steam, water, chemicals and physical damage. In addition, mounting alignment is not critical in that the cable can be mis-aligned somewhat without harm, thus saving installation time. The variety of sensors available allows the system to be easily integrated to existing machine controls. • Cable Tension - Type A unit 2.5 lbs. to 4.2 lbs. (stroke to 96"), Type A unit 1.25 lbs. to 4.2 lbs. (stroke to 192"), Type B unit 1.6 lbs. to 14.27 lbs., Type C unit .75 lbs. to 16.30 lbs.